Date of opening of Price Bids with reference to e-Tender Notice No.PGIDS/3/2018/3 for Rate Contract of Dental Materials is postponed till further order. Information of opening date of Price Bid will be available at this website as soon as it is finalized. Corrigendum to e-tender notice No. PGIMS/Cell-III/18/3137 dated 10.09.2018 reference tender No. 2018 & Tender ID. 2018_ HRY_69677_1 due on 15.10.2018 up to 01:00 PM to be opened on 15.10.2018 at 03:30 PM. Sealed Short Term e-Tenders (Combined Bid System) from Manufacturers / Authorized Distributors/Authorized Dealers / Eligible Bidders are invited regarding AMC of Medical Gas Pipeline System, purchase of consumables, Security Envelopes etc. INSTRUCTIONS AND TECHNICAL DETAILS AVAILABLE ON Portal: www.etenders.hry.nic.in, and University Website: www.uhsr.ac.in. 2. Possession of Digital Signature Certificate (DCS) and registration of the contractors on portal i.e. www.etenders.hry.nic.in is a prerequisite for e-tendering. In Continuation of Notice Inviting E-Tender for Shop No. 9 (Fruit Juice) in Shopping Complex & Canteen in University Administrative Block (Ground Floor) Pt. B D Sharma U H S Rohtak. The Pribid meeting now will be held on 12.02.2018 at 12:30 PM instead of 16.02.2018 at 3:30pm. 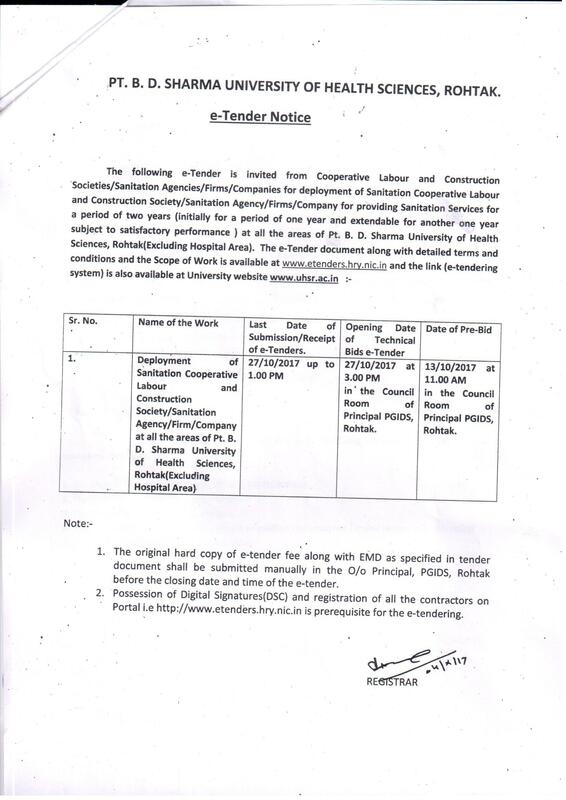 e-tender is floated by University of Health Sciences, Rohtak to Deployment of agency for providing Bearer Services in the Hospital areas of University of Health Sciences (UHS), Rohtak for one year which is extendable for another one year subject to satisfactory services. The e-tender form can be download from e-tender link available on the websites: uhsr.ac.in and from website: etenders.hry.nic.in. The original hard copy of tender fees along with EMD fees as specified in tender document shall be submitted manually in the O/o Medical Superintendent, PGIMS, Rohtak before the closing date & time of e-tender. LONG TERM e-TENDER NOTICE NO.UHSR/PURCHASE/11/2017/09 dt.17.11.2017 due on 18.12.2017 upto 5.00 PM and to be opened on 19.12.2017 at 11.00 AM. due on 13.11.2017 upto 5.00 PM and to be opened on 14.11.2017 at 11.00 AM. Sealed Long Term e-Tenders (2 bid system) from Manufacturers / Authorized Distributors/Authorized Dealers are invited for Rate Contracts for purchase of Furniture Items, Dressing Items, Consumables (drums, developers, toner) for various photocopiers etc. etc. for use in Pt.B.D.Sharma University of Health Sciences, Rohtak (Haryana) India. Instructions and technical details are available on Portal: www.etenders.hry.nic.in, and University Website: www.uhsr.ac.in. Prebid meeting will be held on 23.10.2017 at 11.30 AM in the Committee Room, Director Office PGIMS Rohtak. Specifications after Prebid based on suggestions/mofifications, if any, from the Bidders will be re-uploaded on the portal: etender.hry.nic.in AND WILL BE CONSIDERED FINAL. NO SEPARATE ADVT. IN THE NEWSPAPERS WILL BE GIVEN AFTER PREBID MEETING. Sealed e-Tenders (2 bid system) from Manufacturers / Authorized Distributors/Authorized Dealers are invited for Local e-Tender (applicable within 5 km area from pgims rohtak) for Rate Contract for Two Years (initially for one year and extendable for another year subject to satisfactory services) for Purchase of Medicines & Consumables for ‘A&E’ Deptt. PGIMS Rohtak. Instructions and technical details are available on Portal: www.etenders.hry.nic.in, and University Website: www.uhsr.ac.in. Tender Fees Rs.2,000/- for any one group (non-refundable) in favour of Controller of Finance UHS Rohtak is required. EMD is also required to be submitted and the same has been shown against each group. Tender form is must to be submitted for each quoted group. Prebid meeting will be held on 12.09.2017 at 11.30 AM in the Committee Room, Director Office PGIMS Rohtak. Specifications after Prebid based on suggestions/mofifications, if any, from the Bidders will be re-uploaded on the portal: etender.hry.nic.in and will be considered final. No separate Advt. in the Newspapers will be given after prebid meeting. Corrigendum to LONG TERM e-TENDER NOTICE NO.UHSR/PURCHASE/08/2017/05 dt.11.08.2017 (Due on 14.09.2017 upto 5.00 PM and to be opened on 15.09.2017 at 11.00 AM)—Prebid held on 22.08.2017 at 11.30 AM—For Group No.1,2 and 3. THERE IS NO CHANGE IN THE SPECIFICATIONS OF E-TENDER GROUP NO.4 and 5. 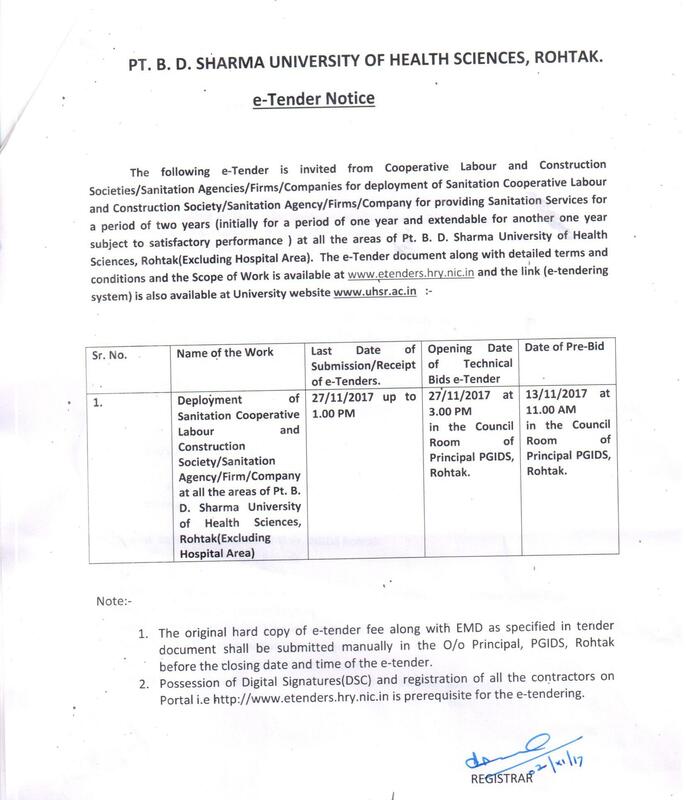 The e-tender of Sanitation Services at Hospital Areas, University of Health Sciences, Rohtak (after Pre bid meeting) is invited for Deployment of Coop. Labour and Construction Societies consisting of all Scheduled Caste members for providing Sanitation Services in Hospital areas of UHS, Rohtak. The e-tender of Security Services, University of Health Sciences. Rohtak (after Pre bid meeting) is invited for Deployment of Sanitation Agency.